It's easy to use and programmable. I love the automatic warm setting. #1 pick of Cooks Illustrated. These regular mouth jars are tall and narrow enough that I can fit 5 inside my slow cooker. They're great for fridge storage, too. 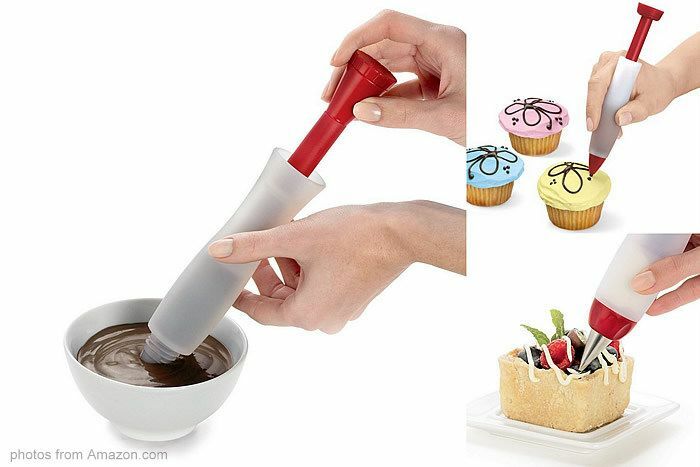 These work well for precisely and neatly dispensing melted chocolate for drizzling and decorating. 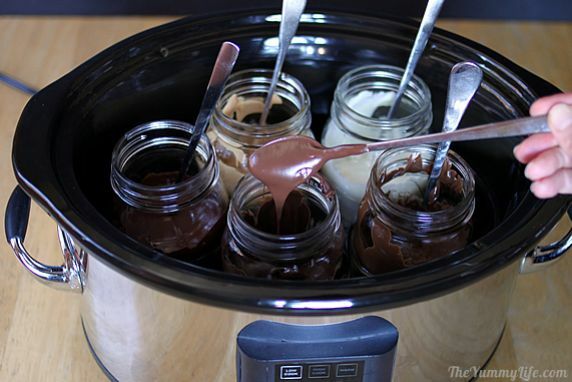 You can set them in jars of water in a slow cooker water bath to keep the chocolate at a melted consistency. This is a great tool for writing with melted chocolate or doing detailed decorating. It's super easy to fill and can be dissembled and washed in the dishwasher. Works with icing for cake and cookie decorating, too. I used these iced tea spoons to stir the melted chocolate. They extend well over the tops of the mason jars. These bowls are heat proof and fit inside my slow cooker. I use these when I need something larger than a jar for dipping cookies or candy. Foolproof and ready for drizzling, dipping, & candy making. A foolproof, easy way to melt chocolate for drizzling, dipping, and candy making. It stays at a perfect melted consistency for hours. 1. Put baking chips (or other melting chocolate) in bowl(s) or jar(s) and set inside slow cooker. 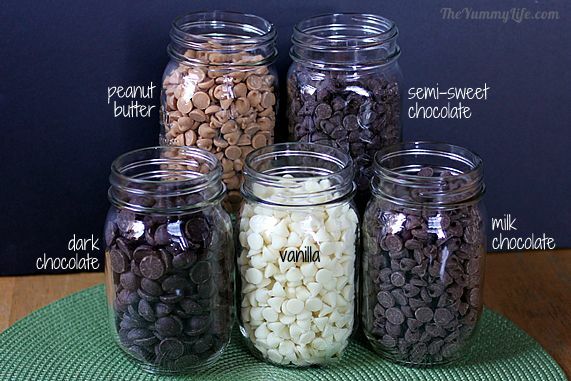 If using more than one, make sure there is a little space between jars/bowls. 2. Add hot water to the slow cooker approx. half way up the sides of the jars/bowls. WARNING: be careful not to get any water inside the jars. Water will make the melted chocolate seize & thicken. 4. Once chips are all melted, lower slow cooker heat to the low or warm setting. NOTE: If you want to speed up the melting, you can zap the jars in the microwave in 20 second intervals, stopping and stirring each time, just until the chips all melt in when stirred. Then transfer to the slow cooker. 5. Chocolate is ready for dipping, drizzling or pouring. It will keep its thin, melted consistency for at least 2-3 hours. --As you're using the melted chocolate, if you discover that you need more, stir in more baking chips; they will keep melting into the mixture. --When you lift individual jars out of the slow cooker to use them, be careful not to drip water into the other jars--water will ruin the melted chocolate. --Dip, drizzle & pour. 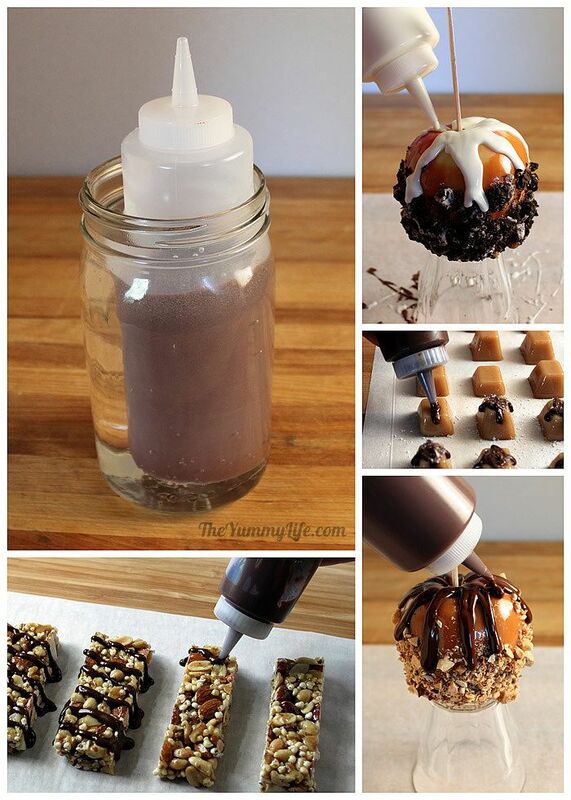 Use a spoon for drizzling melted chocolate onto cookies & candy. For candy bark, pour melted chocolate directly from the jar into the pan or mold. For dunking bigger items like cookies, a bowl will work better than a jar for melting the chocolate. --For cleanup, use a rubber spatula to scrape out as much of the remaining melted chocolate in the jars/bowls as possible. The jars/bowls go into the dishwasher; pour out the water from the slow cooker and dry with a towel. I'm up to my eyeballs in holiday baking at the moment, and much of it seems to involve melted chocolate of some sort. 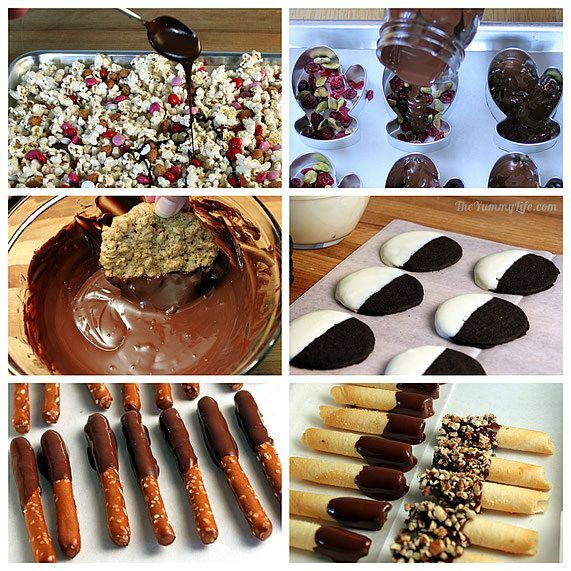 I often need to drizzle, dip, or pour melted chocolate when I'm making candies and cookies. I normally melt baking chips (chocolate, vanilla, peanut butter, etc.). The tricky part is keeping it melted and a thin consistency for an extended time. 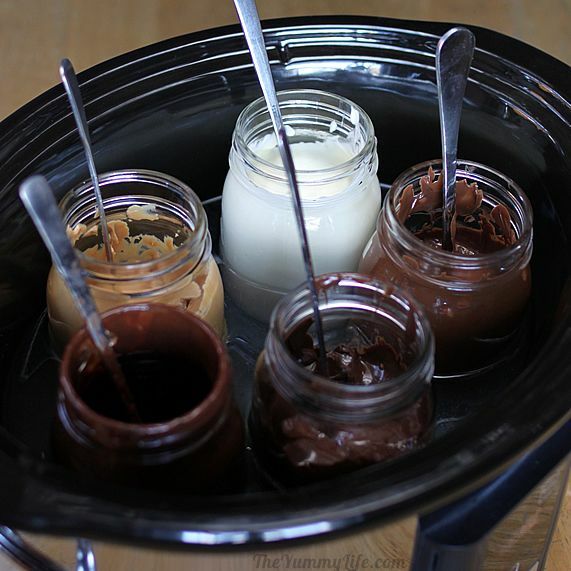 Pinterest made my chocolate melting life forevermore easier when it lead me to an awesome tip from Stacey at SouthernBite.com. To keep melted chocolate at a good candy dipping consistency, she suggested inserting a bowl of melted chocolate into a hot water bath in a slow cooker. Simply brilliant, if you ask me. I tried a similar version of Stacey's trick yesterday when I was melting several different kinds of baking chips to use in different flavors of candy bark. I hope you don't think I'm being overly dramatic in saying that it was life changing. Oh my, did this make my candy making SO MUCH EASIER. No more rushing to get the job done before the bowl of melted chocolate hardened. It kept a thin, melted consistency for several hours while I worked, and it never overheated. Yay! Here's what I did. How to melt chocolate chips (and other baking chips) in a slow cooker and maintain a perfect melted consistency. 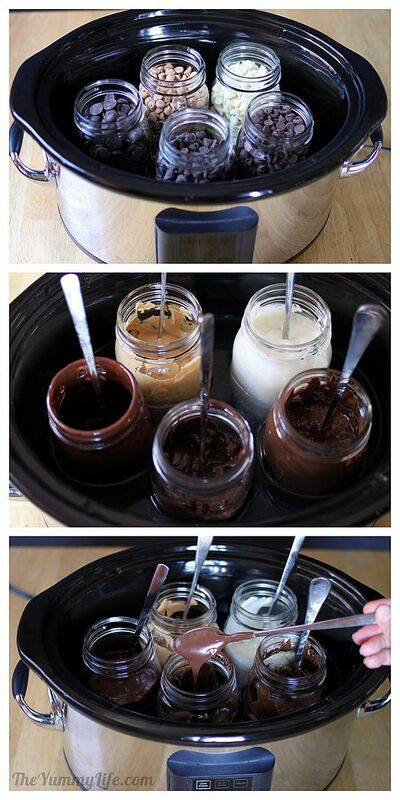 Put the baking chips (or other melting chocolate) in a bowl or jars and set them inside the slow cooker. I used pint mason jars, because they are tall and narrow enough that I could fit several in my slow cooker at one time. You can use wider mouth jars or any heat tolerant bowl that will fit inside your slow cooker. Add hot water to the slow cooker approx. half way up the sides of the jars. WARNING: be careful not to get any water inside the jars. Water will make the melted chocolate seize & thicken. That's it! Now your melted chocolate will keep its thin dipping, drizzling consistency for at least 2-3 hours. As you're using the melted chocolate, if you discover that you need more, stir in more baking chips; they will keep melting into the mixture. I refilled my jars several times as I worked. Easy and foolproof! This method is so easy and is a foolproof way to avoid overcooking the melted chocolate while keeping it at the perfect consistency for dipping and drizzling. I removed the jars from the slow cooker as I needed them, wiped the water off with a towel, and set them next to where I was working. I returned the jars to the slow cooker when I wasn't working with them. WARNING: When you lift individual jars out of the slow cooker to use them, be careful not to drip water into the other jars--water will ruin the melted chocolate. Dip, drizzle & pour. I used a spoon for drizzling melted chocolate onto my popcorn party mix. For my candy bark, I poured the melted chocolate directly from the jar into cookie cutters I was using for molds (see Cookie Cutter Chocolate Bark). For dunking bigger items like cookies, a bowl will work better than a jar for melting the chocolate. Cleanup is a breeze! When I was finished, I used a rubber spatula to scrape out as much of the remaining melted chocolate in the jars as possible. The jars went into the dishwasher; I poured out the water from the slow cooker and dried it with a towel. Done! 1. Add melted chocolate to plastic squeeze bottles for an easy, tidy way to add drizzles or designs to cookies, candy, apples, or cakes. To keep the chocolate melted for an extended time, set the squeeze bottles in a jar of hot water, and place the jar in a slow cooker water bath as described above. The jars keep the squeeze bottles from tipping over. A benefit of this method is that you don't have to worry about water getting inside these squeeze bottles as you pull them in and out of the slow cooker. 2. Use a Decorating Pen to easily add chocolate drizzles and decorations. Similar to the squeeze bottles above, you can be precise and tidy with this. What I love the most about this pen is how easy it is to fill. Put the pen tip in a jar of melted chocolate (kept warm in the slow cooker), and pull the end of the rod; the chocolate gets sucked up into the tube. All you do is squeeze to write and drizzle with it. This is so much easier and tidier than using pastry bags. It doesn't hold a lot, but it's so easy to return to the jar of melted chocolate and refill it, as needed. Clean up is a breeze, too-- disassemble it and put it in the dishwasher. I love this gizmo. Now back to my holiday baking. And dipping. And drizzling. Those tasks just got considerably easier.